You might call Liz Claiborne Have to Have Jeans "must haves"! These comfortable jeans are longtime favorites of Claiborne fans everywhere. Unfortunately, they are not currently being manufactured and thus can prove tricky to find. 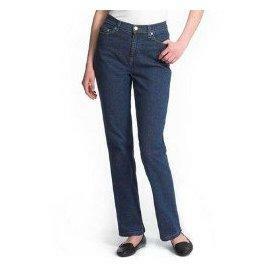 Liz Claiborne's denim lineup is renowned for its selection of classic cuts. These jeans are all about comfort, providing women with an option beyond the trendier denim lines of the world. However, that doesn't mean they shirk on style - if anything, they're even more impressive because they manage to combine the timeliness of a current, hot piece with the timelessness of an enduring style. The result is a collection of jeans, shorts and capris that appeals to women worldwide. If you're on the hunt for Liz Claiborne Have to Have jeans, you may have your work cut out for you. The "Have to Have" label included more than just denim; a quick search reveals everything from wireless bras to cozy jackets. By virtue of its name, the label was all about comfort and practicality. If you're searching for a pair of Have to Have jeans, your best bet is to check out an online auction Web site like eBay. At any given time, there are at least a handful of options available to bid on or purchase. If you're going this route (and you likely will have to if you want to invest in this label, as they are not widely available elsewhere), you may want to try on a few pairs of jeans in a store first. Ascertaining your correct size will make shopping for those Have to Have jeans much easier. Classic Fit Straight Leg Jeans: These are about as classic as you could hope to find. The streamlined cut offers a straight leg that is universally flattering. Worn with flats or boots and paired with everything from simple T-shirts to dressy tunics, these jeans work overtime to offer a multitude of looks. Since they boast a bit of stretch, they're especially comfortable to wear all day long. Essential Original Fit Jeans: With a slightly different cut from the straight leg, the Essential jean is nonetheless all about the classic, timeless style. The flattering straight leg will work nicely in any woman's wardrobe. This style is particularly comfortable for those women who avoid low-rise jeans; these actually sit a bit higher on the waist, which can be more comfortable for many individuals. If you want to expand your options even further, check out a local JC Penny's, the only store to still carry Liz Claiborne. You won't find those Have to Have jeans, but you will find a decent selection of Claiborne merchandise, nonetheless.